Have you seen this Facebook post in your News Feed lately? I think everyone who uses social media has a responsibility to understand how it works. So here’s what’s important to understand. Facebook’s algorithm has been changing constantly since the social media platform was first launched. One of the earliest updates was changing the way posts appeared in the News Feed. Originally, posts appeared in reverse chronological order. In 2009, Facebook debuted a new type of default sorting order based on popularity. The more people engaged with a post by liking, sharing or commenting, the higher it appeared in the News Feed. Also in 2016, Facebook started to predict the likelihood that users would interact with a post based on how users had liked,commented or shared previous posts. If the likelihood was deemed high, these posts were pushed to the top of the user’s newsfeed. Later that year, Facebook also started considering the amount of time that was spent on a post as a possible indication of the level of interest, even if the user didn’t like, comment or share it. In March of 2017, a year after Facebook introduced “Reactions,” Facebook started to prioritize any “Reaction” over a simple “like” as an indicator of engagement. This makes sense as it takes a little more effort to select a reaction than to simply hit the like button. Then in 2018, Mark Zuckerberg made an announcement that Facebook was going to shift their focus from helping users find engaging content to helping users find each other. Facebook’s research indicated that “genuine interaction between friends promotes a strong well-being.” Now the highest priority is being given to posts that generate a back-and-forth discussion among Facebook users, not just simply a like or a share. Now that you understand how the Facebook algorithm works, you understand that the viral post pictured above does one important thing: it prompts a conversation. First, the post asks for a comment…”Do me a favor and leave a quick comment, a quick ‘hello’ or a sticker…”. When one of your friends comments on your post, they are giving a signal to Facebook that they want to interact with you in the future. So it’s no surprise that suddenly you will see a post from them and they will see one from you. When someone “bypasses” the algorithm by encouraging someone to post a comment, they’ve actually triggered it. Secondly, every time I have seen this post come across my News Feed there are lots people commenting on it, mainly because people are often angry that Facebook has taken over their News Feed and taken away their freedom to choose what they see. This back and forth about the content of the post pushes the post up in the News Feed. 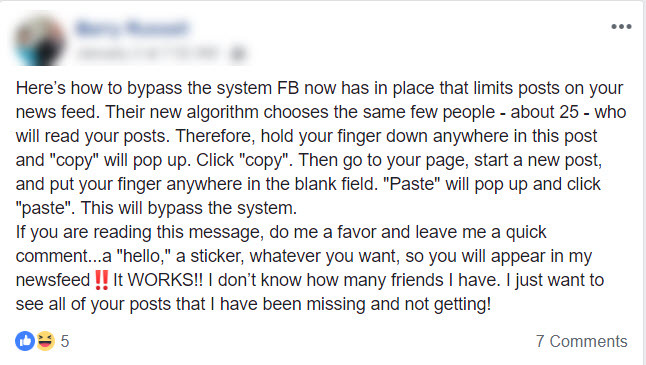 When I’m feeling particularly skeptical, I wonder if the folks at Facebook didn’t plant this post themselves. In all honesty, though, the post does not make me suspicious and it shouldn’t make you angry either. At its core, Facebook is a form of media, just like newspapers and television. It’s a place where brands can find their customers, just like newspapers and television. In order to make money with advertising, Facebook needs to have a happy audience of people to whom brands can pitch. The average person has 155 “friends” on Facebook and 40% of users have “liked” a business page. 32% of Facebook users engage with brands regularly and there are 5 billion comments left on Facebook pages each month. If Facebook had no way to prioritize what we see in our News Feed, it would be a cluttered mess. The algorithm is simply a way for Facebook to make sure that you’re having a good experience so you come back again and again. There’s nothing nefarious or underhanded about the algorithm. There’s no secret plan for Facebook to cut you off from your closest friends. You still have a say in what you see and you can use the algorithm to your advantage now that you understand how it works.